"Removal of organs, electrocution, repeated puncture wounds. I know this sounds crazy, but this seems familiar to me." 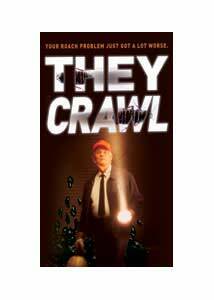 I love a good bug movie, and I thought They Crawl looked pretty promising as a roaches-out-of-control thriller. This is a debut directorial gig for John Allardice, who has spent time as visual effects supervisor for Star Trek: Deep Space Nine and Star Trek: Voyager, so it seemed his visual pedigree was fairly solid. While there are some impressive, if not downright fun, CG roach sequences in this one, the problem is they are used far too infrequently. Soap opera actress Tamara Davies (The Bold and The Beautiful, Port Charles) is Gina O'Bannon, an L.A. detective investigating the mysterious death of a bus driver, whose demise bears a striking resemblance to that of a drug-dealing bio-physicist. She quickly crosses paths with the brother of one of the victims, a sullen marine named Ted Gage (Daniel Cosgrove), and they both find themselves uncovering a weird plot involving genetically-altered cockroaches (no surprise there), as well as a creepy cult, a shifty professor, government conspiracies, encrypted files and of course the ever-present crusty police captain who spends the entire film issuing stern orders and reprimands to the renegade tactics of O'Bannon. My big problem with They Crawl is that the middle section seems to forget that this is supposed to be a rampaging bug movie, and instead turns into something that more closely resembles that of a bad television cop show. O'Bannon spends a lot of time digging up information by talking to informants, including oddly placed cameos by Mickey Rourke and Tone-Loc. Even B-movie icon Tim Thomerson, displayed prominently on the cover (where's Tamara Davies? ), appears only briefly as an uber-exterminator who comes across a horde of hungry roaches. Allardice tries to reel things back in for the big climax, amidst borrowed action footage from The Last Action Hero, Rush Hour and Chain Reaction. A machine-gun-wielding O'Bannon and Gage finally have a fun showdown with a mess of roaches who have a few surprises up their roachy sleeves, and that sequence really made me wish the film had been structured more as a horror film, and less like a cop drama. Image Transfer Review: There is plenty of edge enhancement and ringing on this 1.85:1 anamorphic widescreen transfer from Lion's Gate. That beef aside, the rest of the transfer holds up pretty well, with decently rendered colors and natural fleshtones. Black levels are not exceptionally deep, and shadow delineation is rather poor, especially during the climactic bug confrontation sequence. Audio Transfer Review: They Crawl uses one of those better-than-average 2.0 surround mixes, the kind that sometimes sound better than some of the so-called 5.1 tracks that have appeared on other releases. This isn't a reference disc by any means, but there is a fair amount of rear channel sound effects and music cues that fill things out a bit. Dialogue is clearly mixed, though the overall audio track lacks any substantial bottom end. Extras Review: Extras are minimal, except for the full-length commentary track from first-time director John Allardice and co-producer/writer Neil Elman. Though the two nary mention the pilfered action footage from other films (I guess it was just obvious), their comments about the development of the story, and its marriage of 1950s big bug movies and modern-day genetic engineering, is moderately entertaining, as well as informative. Allardice mentions how he trimmed the film down by 40 minutes, and I couldn't help but wonder why the deleted footage wasn't part of this release. The disc is divided into 24 chapters, and includes subtitles in English and Spanish. When the roaches are present (which was too seldom for my tastes) They Crawl shows glimmers of B-movie greatness. The trouble is the middle chunk that is weighed down by run-of-the-mill police investigations, though it is almost worth it to see Tamara Davies swing on a chain firing a machine gun at a mountain of roaches. Almost.